We have posted articles and held webinars about this topic before, but it is a common misconception about our Married Put – RadioActive Trading approach. Many options investors evaluating the RadioActive Technique come from a background of Covered Call investing, selling Cash Secured Naked Puts, trading Credit Spreads or other combination plays. With these strategies investors ‘generate’ an option premium or a credit up front for income. Most of these strategies are traded using options that expire one month out, or less. 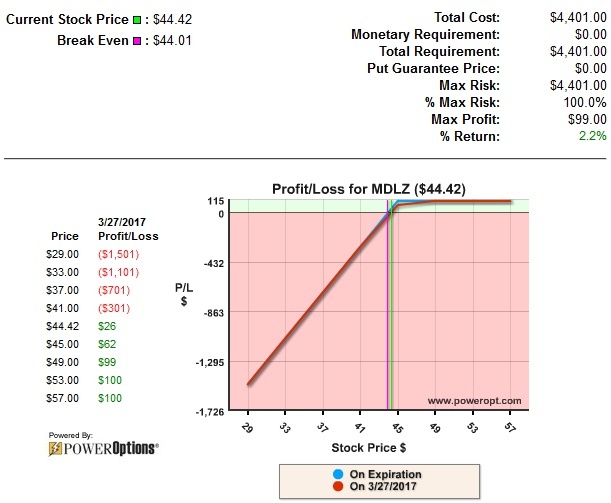 We know up front that our maximum return, the best case scenario, is $99.00 of profit or 2.2% – if MDLZ is above $45.00 on March 31st. We also know that we will lose money on this covered call if MDLZ is below the break-even of $44.01 on March 31, our cost basis for the covered call, and we could lose a lot of money if the stock falls -10%, -15% or more with this setup. But, we know the break-even up front, and that we need the stock to be above $44.01 on March 31st to make any profit. Again, we know up front that our goal is to earn the maximum return of 15.6%, if MDLZ remains above $43.50 on March 31st. Both puts would expire worthless and we would keep the net credit of $0.27. We also know that we will lose money on this credit spread if MDLZ is below the break-even of $43.23 on March 31, and the maximum loss of -$1.73 would occur if the stock was below $41.50. This would be more than 6 times the maximum potential profit… one full loss would wipe out 6 or more previous positions’ gains. And again, we know the break-even point up front, which may be a target price for adjusting the position to minimize loss. This is a different structure, but still a bullish position. There is no calculated maximum return, as the upside is unlimited. The maximum risk is $3.06, which is higher than the Bull Put spread, but that monetary loss represents only 6% of what we have invested in the position – not 100% of the investment as it is with the Bull Put spread. And, that maximum loss is likely only to be realized at expiration, which is over 300 days away. Why add cost to the position? You are not going to make a dime until the stock goes above $50.06? Answer: Correct… if and only if we held MDLZ all the way to January 2018 expiration, made no adjustments to the position and accepted no dividends. If we held the position all the way to January expiration and made no adjustments, we would still collect $0.76 in dividends knocking the maximum risk down to $2.30. This is less of a monetary risk than doing 2 contracts of the Bull Put Spread. Also, this is a positive Delta position – if the stock moves up $1.00 in the first month, we may only lose -$0.50 on the protective put. The position would be at a profit. The break-even for the far term position is only relevant at expiration. So, the real answer is no. I could make a dime on this position if the stock moves up $0.20 or $0.25 in the first week or two. But, our goals are higher. But you paid $5.40 for the put… you are already underwater by 12% when you open the position!?! Answer: Nope. Yes, paying $5.40 for a protective put on a stock trading at $44.66 seems expensive. But, we bought an In-The-Money $47.00 strike put. This means that $2.34 of that $5.40 cost is intrinsic value, and we are guaranteed to get that back. The true risk on the position is only the extrinsic, or time value, on the position. This is why the maximum risk is only $3.06. Okay, so you are $3.06 underwater or behind the 8-ball, and will need the stock to move up $3.16 to make a dime!?! That is the only time we would likely realize the full loss of $3.06 – or need the stock to be trading above $50.06 to make a profit. And that is not the plan. But, let’s us consider something else: Are we $5.40 or even $3.06 underwater when we open the position? No. The put is not simply just insurance. It is a working asset that we purchased. The put does not go to $0.00 when we enter the trade. In fact, all we are losing – or are ‘behind’ – in the trade when we open a RadioActive Married Put is the bid-ask spread of the put option. Oh, so we could have made 0.2% in one day. Wheee! Of course that is not our goal. But, hey! Look at the profit. We could have made more than a dime on the position and the stock is at $44.88 – still nowhere near the ‘break-even’ of $50.06. Okay, but the other two trades generate income, lower the cost (break-even) and are shorter term trades. They will give a better profit over time!?! Huh…seems as though if our expectations were met the ‘extra cost’ RadioActive Married Put would have the highest monetary gain. Of course, the Bull Put has the highest % gain due to leverage. Which brings us to the other side. What if we were wrong, and the stock fell -5%, or -$2.23, in the first 15 days? Covered Call – The 45 strike call would expire worthless. If liquidated, the covered call would have a loss of -$1.58, or -3.6% of the investment. Bull Put Spread – The long 41.50 put would expire worthless. We would have to take assignment of the stock, or buy to close the 43.50 short put for a cost of about -$1.07. This is not the maximum loss, but is close to 5 times higher than the expected profit. In other words, we may have erased the gains of close to 5 previous spreads with this strategy. And in terms of leverage, a loss of -$1.07 represents a loss of -62% of the investment, or margin for the spread. Yikes. RadioActive Married Put – We would have an unrealized loss of -$2.23 on the stock. But, we would have a gain on the put around $1.25 (put would be priced at about $6.65). If we liquidated the position we would have a loss of only -$0.98, or -1.9% of our investment. So… are the shorter term trades which generate income and lower the break-even better trades? Not in this example. The RadioActive Married Put had a higher monetary (but lower) percentage gain if our expectations were right. If we were wrong, the RadioActive Married Put would have a lower monetary and percentage loss compared to the other two strategies. This is why we advocate this strategy, and why we trade it in our personal accounts. We already showed how the protective put does not put you behind the 8-ball when the position is opened, and the ‘break-even’ on a RadioActive Trade due to the cost of the put is only relevant at expiration – several months out in time. We showed how the RadioActive Married Put could earn more than these income strategies with a 5% increase, and lose less than those strategies with a -5% decrease. 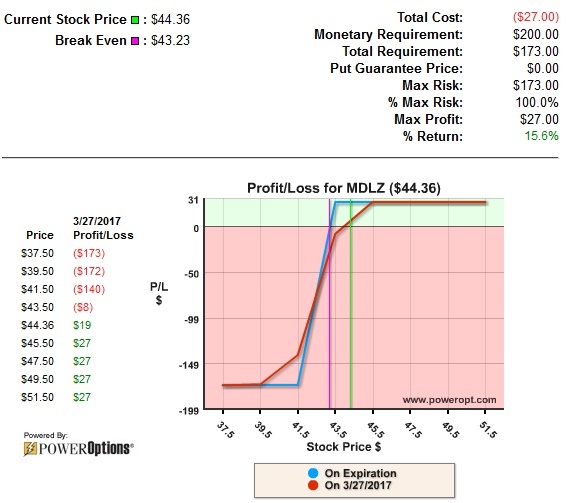 If your covered call trading plan is to make 2% every 14 days or so, you saw how a -5% decrease would result in a loss of -3.6%. This loss, though small, would take out almost 2 previous wins. Think about the math on that…you would need to be right over 65% of the time to profit long term. And it would not be that big of a profit. If your Bull Put trading plan is to make 15% leveraged gain, with a 75% probability of success, you are likely opening positions that have a 6:1 or 7:1 risk:reward ratio. This means you need to be right closer to 85% of the time to profit long-term. Again, yikes. If you control risk and make only 2.1% on winners, and lose only -1.9% on the losers, you can actually be wrong more often than right and still make money. As I mentioned our profit goals are higher, and achievable, for each position, and at times we can actually cancel the risk on our RadioActive Trades. Have you seen the success rate you have hoped for with the Covered Call Strategy? Is your portfolio full of stocks that have gone down so that writing new calls at the lower strike price have the danger of being assigned for a loss? Have you seen successful trades on credit spreads, only to watch your portfolio lose value over time even with a success rate of 70% or higher? Maybe it is time to consider a different trading strategy, and see how the RadioActive Trading techniques can enhance your portfolio. Michael Chupka is the Director of Education for Power Financial Group Inc., publisher of PowerOptions, a patented online suite of options investment research and analysis tools. He has co-authored two books, the first on Naked Put strategies and the second on the protective Married Put and Collar strategies. you get the stock “PUT” to you. You lose the entire amount you paid for the put at expiration, no? Thanks for all your videos and teaching. I do enjoy them. I hesitate to comment as it will likely expose my ignorance but here it goes. My first more lengthy attempt was lost with an inadvertent key stroke so this attempt will be concise. The time period for the married put strategy is 309 days and 15 days for the covered call and spread plays. I see that you address that in your final point too. Circumstances would not allow for 20 repetitions of the covered call and spread strategies but it might be reasonable to repeat those at least 7-8 times in 309 days thus allowing for some loss but still overall profitable strategy. The assumption of a full loss on 1 or 2 trades also ignores the potential for adjustments that could and should be made to avoid the full $1,743 loss on any of the spread transactions. I know that this ignores your often repeated well reasoned caution that one failed spread can wipe out 5 or 6 successful ones. A 100% failure should be more rare given that in most cases adjustments can be made if properly monitored thus improving the ratio of successful spreads. 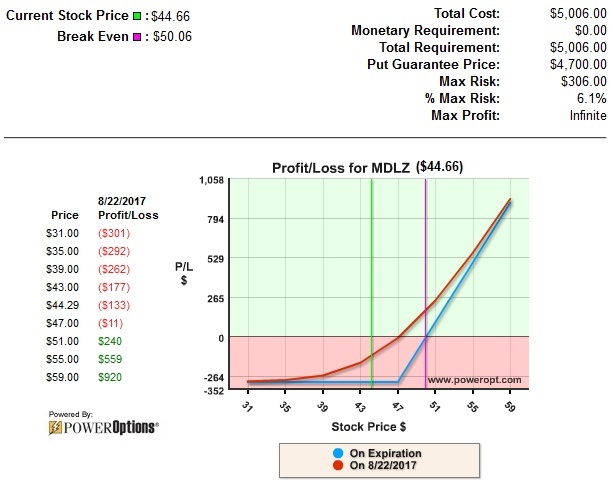 As a new subscriber to PowerOptions I have to say that the PowerOptions and associated sites are the most useful I have found and the only one that I have been willing to pay for over 3 years or so of becoming a more manager of our investments. Thank you.